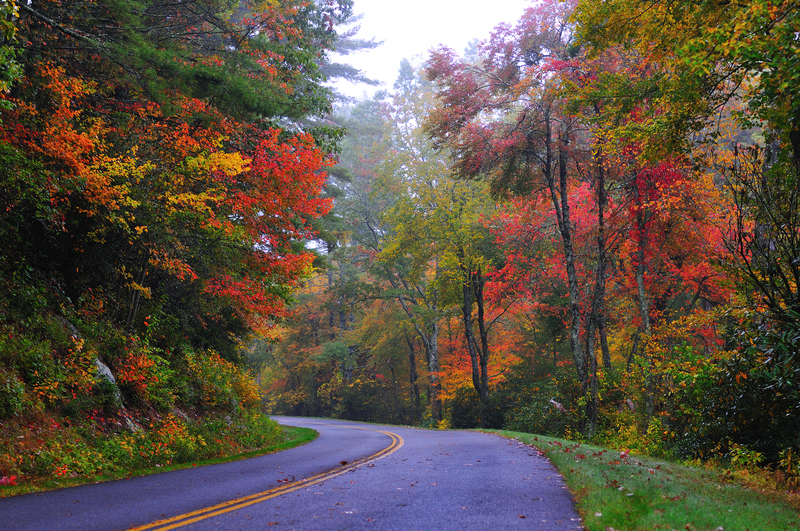 Fall on the Blue Ridge Parkway. opportunity for fall leaf-looking from easily accessible locations. Peak red, yellow and fiery orange comes at higher elevations first and then works its way down the mountainside and into town over time. While the entire fall season is not all about leaf-looking it's also a great time for apple picking (cider-drinking), visits to the pumpkin patch and clear-view hikes. The first week of November is typically also the beginning of Christmas decorations at the Biltmore Estate so you can get an early start on holiday spirit throughout November and December. See fall color from the treetops on a zipline tour. Zipline tours are offered from March through October. Hiking during the fall color season can give you a whole new perspective of fall color. View our fall color page for tips on typical time frames for different locations' peak color. Fall is a popular time for fall beer releases - Oktoberfest beers, pumpkin pie beers, bourbon barrel beers and more. Check out our local breweries for fall brew release events. Looking for more event options? Find event options here.